Stop! 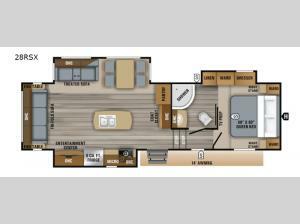 Check out this Jayco Eagle HTX 28RSX fifth wheel. You won't be disappointed with all the features it has to offer, like the kitchen island to make meal prep a breeze with the added counter space and extra storage space. Inside the rear living area, you will find a comfortable theater sofa with spots to hold your favorite beverage, and a tri-fold sofa with end tables on either side, plus it can be transformed into an extra sleeping space at night. There is also a front private bedroom with a walk-around queen bed, night stands on either side, a dresser, a wardrobe, and even a linen closet. Plus, you have access to the dual entry bath!